Time travel to the magical world of Indian art, heritage, and handicrafts showcased through a fascinating panorama of craft, cuisine and cultural activities. 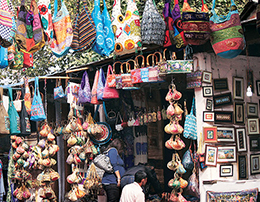 The environs of Dilli Haat is enough to transport you back to the village culture, where various people come and boast of their crafts, selling native, utilitarian as well as ethnic products from all corners of the country. Shop until your Last Breath!